"Great steamy puddings!" 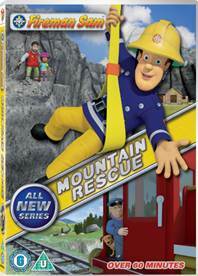 we were lucky enough to be sent a copy of Fireman Sam, Mountain Rescue DVD to review and also we have a copy for one of you lovely readers to win! Expect 6 action packed entertaining new adventures, full of pontypandy regulars and also a host of new characters - I'm already a fan of survival expert Moose Roberts and motorbike mad Blake (my two year old) loves the newest rescue vehicle - Mercury the quad bike! I love watching cartoons with Blake, he likes to act out what he's watching so we've had quite a few fireman Blake afternoons! I couldn't help giggle at the giant cake in one of the episodes - Norman got stuck in it! And the mountain climbing episode reminded me of growing up in the lake district, although I'd say it was a very similar mountain and train to Mount Snowdon! I have one copy of Fireman Sam Mountain Rescue for one of my lucky readers to win. To enter, please answer the following question. What's the name of the new rescue vehicle quad bike? Please remember to include a way of contacting you in your comment eg, twitter@ , Facebook ID or email address. Competition closes on Monday 26th March at 12 noon. Open to the UK only. Prize will be sent directly from the PR agent. Winner picked by random.org. Please respond within 3 days or another winner will be chosen. What's the name of the new rescue vehicle quad bike? MERCURY! Great review and giveaway! I've 4 little Fireman Sam fans in my household! Gonna pre-order this for my FS obsessed 3yo EJ. Mercury, moose roberts is already a ledge in our house! Mercury. With baby twins and a toddler to entertain fireman sam is a lifesaver! Ah fireman Sam getting better with age! Mercury! My daughter would love this prize! MERCURY @judy2357 on Twitter Good luck everyone!! What a fab response again!